Founded in 1979, we are a three-generation family business that serves the hard of hearing residents of Oakville. We were originally started by Mr. Martin Clarke. When he retired, his daughter, Jennifer Nolan, took over the business. Now Jennifer’s son, Clarke Nolan, is helping run the clinic, along with Wendy Caswell. Linda Glick has been our competent and friendly office manager for over 10 years. She is always available and happy to assist you. With three hearing instrument specialists on staff, you always get the attention and care you deserve. In fact, our specialists Jennifer and Wendy have over 25 years’ experience in the field. We pride ourselves on offering the highest level of customer service, knowledge, and equipment. We are dedicated to our patients, offering professional and caring services for those in need of hearing assistance, even visiting our senior patients in home if needed. Our level of experience and commitment to our profession is unsurpassed. Our goal is to provide the hard of hearing residents of Oakville with the best hearing possible, working with you on a one-to-one basis. Lakeshore Paramedical Hearing Services Inc. was recently profiled in Canadian Open Magazine. Read the article below! It’s not very often that one finds a family-run business that has been established since 1979. 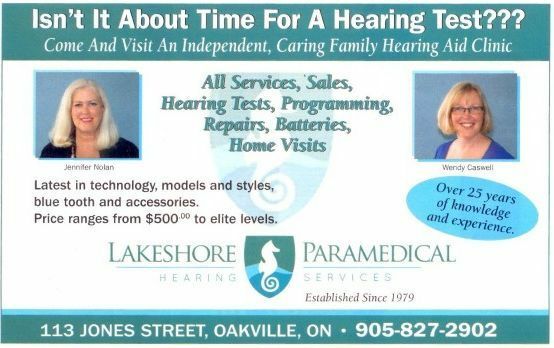 Lakeshore Paramedical Hearing Services is an independent, family-run hearing aid clinic that has been serving the Oakville, Bronte and Burlington hard-of-hearing adult for the past 38 years. They have a friendly, caring atmosphere in their clinic that helps a patient feel involved in the process of finding out if a hearing aid is necessary, and if so, what company, style and price is most appropriate. There are two Hearing Instrument Specialists on staff: Jennifer Nolan, the owner who has been practicing for over 25 years, and Wendy Caswell, who has over 30 years in the field. There is no substitute for experience and knowledge. These ladies have seen this health care field change from big 3-inch, over-the-ear hearing aids to discrete, almost invisible, deep-in-the-ear styles. They are passionate, educated in all the new styles and models and deal with numerous hearing aid manufacturers. When you are an independent owner, you have the freedom to take advantage of all manufacturers and models available. Both Jennifer and Wendy pride themselves on staying on top of all new technology, digital circuitry and Bluetooth accessories. They offer complimentary hearing tests for those who feel they require amplification and a full range of services. They provide reprogramming of existing hearing aids, cleanings, tubing changes, in office repairs and computerized analysis. They also have the latest in verification equipment to ensure your existing hearing instrument is matched to your specific prescription. They pride themselves in making everyone feel at ease and will work with a patient until they are comfortable with the style, sound and price of their hearing aid. They carry a vast array of instrument technology and price, from the introductory and basic, to the advanced and elite level. They are also pleased with number of concerned Zoomer aged patients that are calling for hearing testing and answers about preserving their hearing health. Their clinic prides itself with client and doctor referrals. They also have a unique rewards program. They support and are registered with the Ministry of Health, Veteran’s Affairs, Worker’s Safety Insurance Board and numerous insurance companies. They accept MasterCard, Visa, debit and personal cheques for all services. They are open 5 days a week and will accommodate early and late appointments if required. They also offer a no-charge trial period of up to 90 days if required. They will even provide home visits for those who do not drive or have mobility issues. There is also free, ample parking. Jennifer and Wendy invite you to visit them for a warm and friendly experience and be impressed with their knowledge and service. You can call for an appointment at 905-827-2902 or email us at info@lakeshoreparamedical.com. Contact us today to schedule an appointment at our clinic.